Jewelry display cases are glass display showcase or wooden display showcase that used in jewelry shop & jewelry showroom to present customer good jewelry displays. Those display cases are usually design & build in a unique and functional style to attract customers. Most of the display cases are made with glass and wood combined together to create a display section on top. Where jewelry and valuable products will be displayed. Nowadays, more and more metal material are used in the jewelry display cases. For example, the most popular models in the last decades are made with stainless steel and electronic plating finish. However, Those technologies are costly. Tempered glass with the wooden base is still in the mainstream. 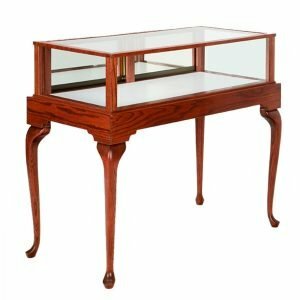 Where to buy jewelry display case that made of quality glass, led lights & plywood with an affordable cost? Well, here you are in the right place. Unique provides a large variety of jewelry display case for sale. Our collection includes traditional wooden jewelry display cabinet, and modern steel jewelry display case. All the Jewelry Display cases come in a wide range of dimensions and styles to ensure that all your custom needs are met accordingly. Whether you need a fully-assembled display case or a modern customized display case or a Bespoke display Cabinet, Browse our curated catalog offering the finest collections by experienced showcase manufacturers & designers. Whatever your style or personal expression you will discover a wide selection of unique c cases & cabinets here. 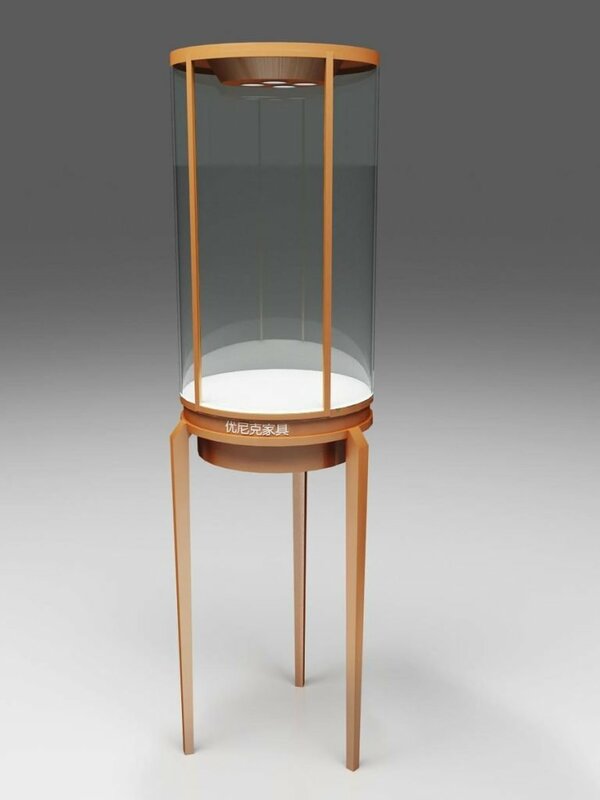 Our high-quality jewelry display cases are hand built in Shenzhen and exported all over the world Especially to the United States which is our main market. Our jewelry showcases are built with lights, locks, logo ready finished and arrive at you fully assembled. You just need to unpack the packages and move the showcase to the right position to start to use it. Our high quality finished display case are welcomed in many jewelry shops, stores, showrooms, and even some museums. We often hear from happy customers who ordered showcase from us introduce our company to his friend or partners. Whether you need single one pic of showcase or large quality, you can count on getting the highest quality jewelry display case from us. All the showcase in our company is customized according to your requirement and ideal design and finished in a professional way. Because jewelry is expensive & valuable products, So, We also offer secure display cases. Here are some features. Tempered glass on top, with a metal frame on sides to protect it. very strong and durable design. UL listed LED lights and transformers integrated with a bright energy to make the jewelry products shining & Outstanding. Strong lock system made by stainless steel with a password to open and close. For some special customers, we offer laminated glass which is bulletproof, can be used in a bank or public jewelry center. The jewelry display cabinets for sale here come in various sizes and finishes in order to match or blend with any décor & different budgets. Those jewelry display cabinets are usually used in the middle of the store or showroom, and connect together to create a sales counter between staff and customers, These store fixtures are normally seen in jewelry stores, boutiques even museums to display high-end items. Some of those are used in the shopping mall which is called a jewelry kiosk. 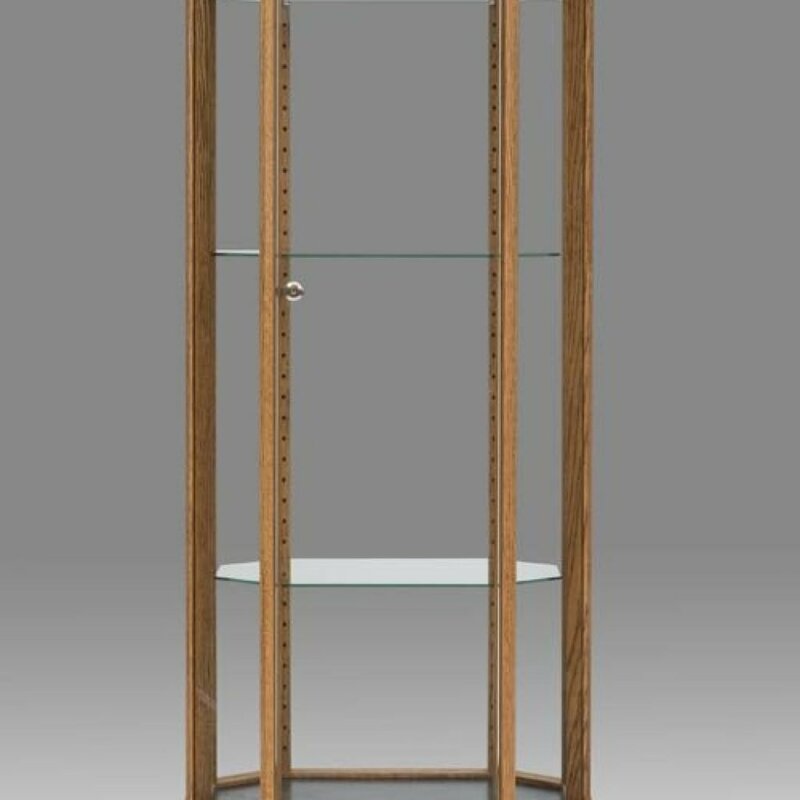 All the wood jewelry display cabinet are mainly build with two parts, top glass display area, and bottom storage parts. In the latest modern popular wooden display cabinets. Some manufacturers hollowed the bottom part to create a unique and fashion style while the top keeps display with lights and lock system. This brave trial not only makes the showcase more elegant but also reduce the cost. There is a variety of wood finishes for the base part of the jewelry display cabinet. We usually for plastic lamination (HPL) finish and natural wood sheet in veneer finish. Both of this can create a wooden texture on the surface, So, if you are interested in getting a wooden display cabinet, Our designer can help you create a 3D design with different kinds of wood styles. From American Oak wood to Australia birch, we have a large variety of wood options for you to choose. The glass is the most important material that uses on a jewelry display case. So, usually, when a customer is looking for a display showcase, they actually looking for a glass display case. With a clear translucent character and flat strong surface. glasses have replaced plexiglass and acrylic in many places. In Unique Kiosk, All of the glass used in these showcases are tempered. Tempered glass is 10 times stronger than without, And even it breaks it will break into small piece and not hurt anyone. Use these glass showcases to not only for home display requirements but also to create an area with store fixtures to interact with customers. We use stainless steel frame & aluminum for the frame of glass display showcases. especially for museum display showcase which is in big size glass. Normal wooden bases are not strong enough to hold such big glass doors and sides wall, Metal, and aluminum are just perfect for this. We have a large range of aluminum glass display showcase for sale. Browse our sites and find your favorite models with the best price. How Much for Jewelry display showcase? As for different usages and different places that used. Glass jewelry display case can be classified as the following 4 kinds. Wall mount display case & Jewelry wall cabinet. Wall mounted jewelry display showcase is widely used in a jewelry shop and showroom, even in some of the museum you will see a hanging display showcase, This types of jewelry display case usually build with a wood or metal frame to fixed on the back wall with front sides two glass doors and several glass shelves for display. 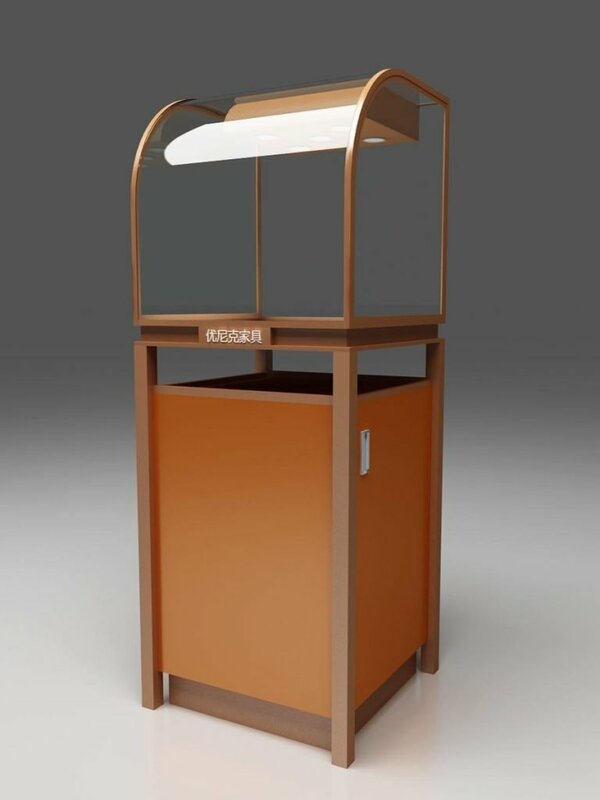 For jewelry shops and jewelry trade center, we will use a retail counter display case. Those are standard modular display case that can be connected together to create a retail kiosk. If you want to check more jewelry retail kiosk design, click>>>(jewelry kiosk). Each jewelry display counter is also free to stand while putting together, you can create a safe and fixed retail shop. 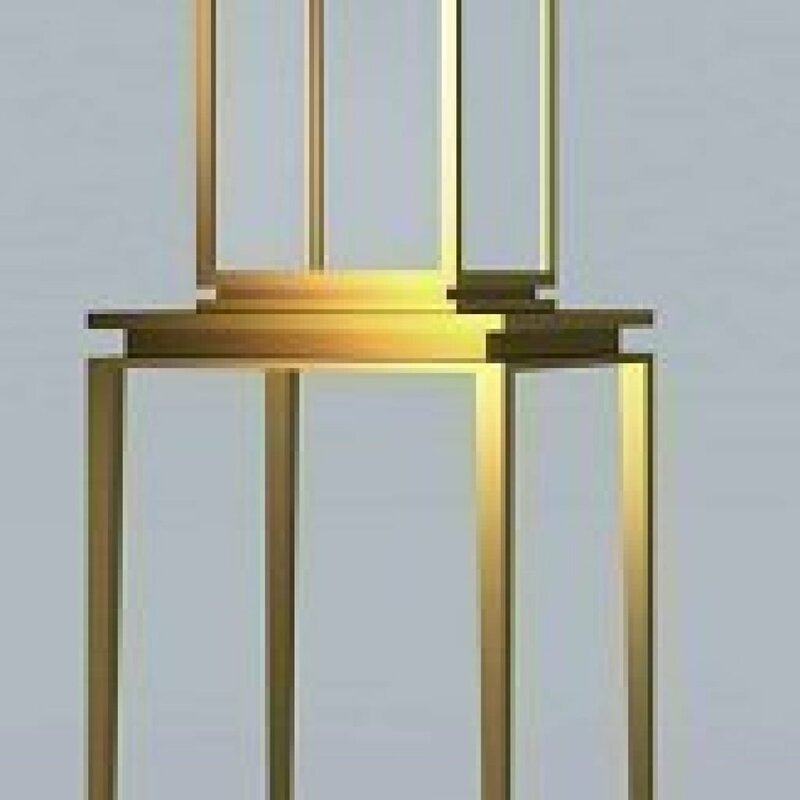 The free stand jewelry display cases are pedestal stands that can be easily moved and relocated showcases. Those portable jewellery display cases are usually used for exhibition, show or in the middle of the shop to display some certain products. In order to make those products more outstanding. We usually feature additional track lighting around the top or use spotlight gives a special product a focus. There are also jewelry display cases here that have a removable acrylic top and wood base to allow change a featured piece of products. For some upscale customers, we have some special countertop display cases with limited options. With an ultra-translucent glass lid and solid wood base, Those display case are specially build for the best products. Those display case are light, elegant and easy to move. The top of the showcase features access doors in the rear, some of them are open from the top. Customers can get a complete close view of the displayed merchandise from all sides. Unique Kiosk is a leading jewelry display case manufacturer and designer, We custom design and builds high-quality jewelry display cabinets and display showcase for sale with a cheap price. Since 2002, thousands of showcases, cabinets, jewelry counters has been built and delivery all over the world. Most of them are sent to the USA, Canada, Australia, and the UK. We aim to provide affordable cost jewelry display cases & fixtures for all the clients who want to engage in retail business. Contact our team and find your best display furniture.